It Was Fifty Years Ago Today! Is supposedly a look at The Beatles Sgt Pepper's Lonely Hearts Club Band. A look at the creation and impact of what many people say is the greatest album of all time, certainly one of the most influential. That's what you would think if you were just browsing the cover. Instead, what we get is a classic example of why anything related to The Beatles is always created and distributed by The Beatles: Copyright. This documentary features no Beatles music, very little from them, other than archive news footage and little in the way of any notable people to hear from. Those who have just watched Ron Howard's Eight Days A Week and then watched this will probably see night and day the issues with this release. Again it is one of copyright. It is like those 'Best of the 60s' albums you would get from the shops that feature no Beatles music (who created arguably the best music of the 60s in general). Without this context this documentary is rather dull and boring. It relies on the viewer to know everything. They mention songs, but without hearing them you will need to have a copy of Sgt Pepper on hand to know what they are talking about. That being said, this is not a bad documentary, just, as I say, a rather restless and boring one. Despite the title, they spend very little time talking about the album. If you were to watch this and then be asked name all the songs from the album, you couldn't do it. They discuss the controversial tour of America after Lennon's 'More Popular than Jesus' and also the death of Brian Epstein. The release of Penny Lane and Strawberry Fields as a Double A-side is discussed as well as constantly talking about how this should have been added to Sgt Pepper. Again, if you have no idea what these songs sound like then it is a pointless argument. The cover art is talked about, but again it is not shown fully and so again if you had no idea what they were talking about you would be lost. There is then a great deal of talking about the influence of the Maharishi Mahesh Yogi, but again not much about the creation or reception of Sgt Pepper. They talk about how commercially successful it was, but don't mention how important it was that the album won the Grammy for Album of the Year being the first Rock album to do so. By the end of the rambling documentary they conclude that the album was important, but by that point you could be forgiven for forgetting what the subject matter was supposed to be. 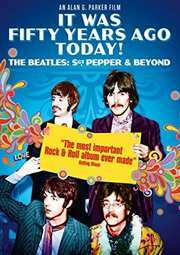 I get the feeling that the creators added the 'Sgt Pepper and Beyond' tagline simply because they realised how little they actually spoke about the album. This set is brimming with extras which, depending on how much you love The Beatles, are either fascinating or dull. The problem I have is that most, despite being informative, are not entertaining. Interview with Producer and Director is fine, but a little bland. An interview with The Merseybeat is something only an avid fan would watch as is the one with The Bootleg Beatles. As is the interview with Pete Best, The Beatles' original drummer. This would have been fine if this had been an 'Origins' documentary, but it was about a specific time and so his stories are a little irrelevant. An archive interview with Ringo is utterly pointless as is the look at John Lennon's Blue Plaque being installed. Liverpool/London is a montage look at all the places in these Cities where The Beatles made their mark. My advice is to grab your copy of Sgt Pepper, mute the volume and watch listening to The Beatles as that would have been more effective. The two interviews that are pretty interesting are with Julia Baird, who is John Lennon's sister who has some interesting stories about her brother. Also a story by Andy Peebles about interviewing Lennon before he died. This is a sad, but interesting story about interviewing Lennon and then when he landed back in London he had died. It would have been great to have heard or read what the interview was though. It Was Fifty Years Ago Today is such a strange documentary. If you know everything about The Beatles and the Sgt Pepper album then you may be able to fill in some of the gaps. However, if you have no idea then this is a poorly made documentary that veers too far off its subject matter and at times doesn't even focus on the thing it is being distracted by. A good documentary for avid fans, but the casual fan will be lost. Even if they had just spent a few minutes discussing the songs it would have been fine, but they don't even do that. There were far too many blanks for me to fill in and is a good example of what happens when you do not have the rights to your subject matter. If they couldn't do that then they probably shouldn't have bothered.